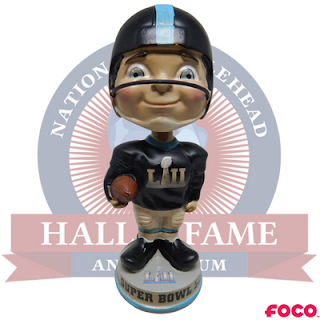 The National Bobblehead Hall of Fame and Museum has unveiled a Limited Edition bobblehead commemorating Super Bowl LII, which is being played on Sunday, February 2, 2018 at U.S. Bank Stadium in Minneapolis, Minnesota. The bobblehead features the classic vintage football design with the official Super Bowl logos. The bobbleheads are only available in the National Bobblehead HOF and Museum’s Online Store. This is the second time that Minnesota has hosted a Super Bowl, with Super Bowl XXVI in 1992 held at the Hubert H. Humphrey Metrodome. In that game, the Washington Redskins defeated the Buffalo Bills by a score of 37-24. U.S. Bank Stadium, which opened in 2016, will be hosting its first Super Bowl with the NFC and AFC Champions facing off on Super Bowl Sunday. The bobbleheads, which are officially licensed and produced by FOCO, are in stock and ship now. All orders placed by Tuesday, January 29th are guaranteed for arrival by the Super Bowl. The bobbleheads are $25 each, with flat rate shipping of $8 per order. This marks the third consecutive year that the HOF and Museum has released a bobblehead commemorating the Super Bowl.